The courtyard also acts as a venue for installations and events and is served by a glass-fronted café. From the courtyard, and from key internal locations through the glazed skylights, it is now possible to see previously hidden façades of the museum’s original buildings, including the detailed sgraffito decoration on the Henry Cole Wing which has been revealed to the public for the first time since 1873. 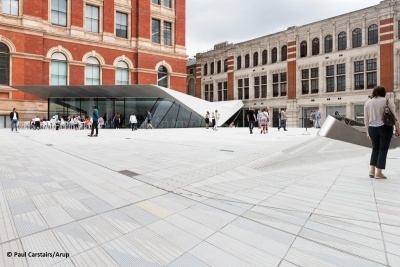 Following an extensive international competition Amanda Levete Architects (AL_A), working with Arup, were appointed as the designers of this scheme. 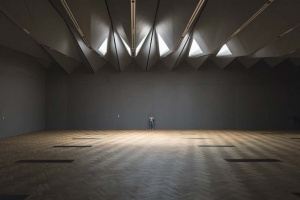 Key to the success of the competition was the use of structural steelwork for the concept design for the ‘folded plate roof’, a system of triangular steel trusses which span 38m across the gallery, support the courtyard, café, and crucially allow the changes of existing ground levels to be fully exploited to fit in a mezzanine floor. As well as the significant vertical loads that this structure supports, it is also resisting significant prop forces as it is the ground level structure of a 15m deep basement. The beams and columns are expressed within the volume of the stairwell, so that as visitors pass from the entrance to the gallery they understand how the façade above is supported, and where they are in relation to the rest of the museum. The ‘folded plate’ structure comprises 13 ‘Toblerone’ trusses supported on an inclined storey-height mezzanine truss. Through optimising both the overall geometry and the geometry of the members making up the trusses, the design team was able to save 40% of the steel weight of the initial concept. Early engagement by Arup with Bourne and the steel industry during the design process meant that the design moved from needing extensive temporary support to erect it to one where the ‘Toblerones’ were self-stable for ease of erection. The unique geometry of each truss and the difficulty in positioning meant that the fabrication had to be precise in its execution. 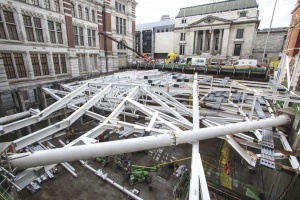 Due to the geometry and sheer size of the trusses, bespoke jigs needed to be made to aid fabrication and much of the fabrication needed to be carried out with the use of mobile elevating working platforms (MEWPs). Precision checks offsite and on-site showed that exceptional tolerances were achieved and meant that each of the trusses was dropped into place on time, first time, every time.